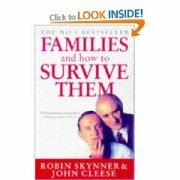 Families and How to Survive Them is not a new book, although it is definitely is one of the best books on family relationships and child social development for non-professionals. Most people have emotions they can't handle, so they hide them. By choosing partners with the same inhibitions, the problem is often passed on to their children. The book looks at how families influence children and what problems might arise and how to avoid them. This book is not pop psychology, the content is very well well-grounded in the principles of family systems and scientific ideas. Inevitably the book includes humour and funny sketches.